A quartet of musicians fusioning folk music from far east to far west. Expect to listen to an Acoustic and folk music from many different places in the world – Scotland, Ireland, Hawai’i, Okinawa, and more. Plays guitar, flute, clarinet, accordion, sanshin, ukulele, and more. 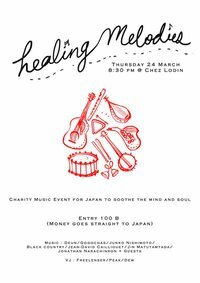 During The GoGochas session, Jun, will play Sanshin (Okinawan musical instrument) and interpret “Full Moon Evening” （満月の夕), a popular song composed after the Kobe earthquake to give hope and soothe the survivors. A dual vocal band, who play dark country music covers (Nancy & Lee, Nick Cave, and others). Male and female vocals, guitar, Cajun and harmonica (hopefully Mick). Jean-David Caillouët is a sound and film artist based in Bangkok. As a multi-instrumentalist and producer, he has collaborated with artists as varied as the composers Kimho Ip from Hong Kong and Anothai Nitibhon from Thailand, Cape Coast based musician Kwesi Quayson, the Scottish Indie band Aberfeldy and Celtic singer Heather MacLeod. He has performed internationally, playing well respected festivals such as Celtic Connections or the Edinburgh Fringe. Jin is a Silpakorn University’s talented sound artist who is interested in experimental ambient, using synthesizers and other musical instruments. Jonathan is an acoustic guitar player who teaches at university. It’s a first time for all three to work out together.